This is one of my favourite Turkish dishes. Translated literally, Imam Bayildi means ‘the imam fainted’. The story goes that the imam fainted upon hearing how much olive oil goes into this dish – an ingredient so expensive that it made the poor imam swoon at the cost of what he had just eaten. Smaller aubergines work best for this dish as they soften more quickly. Imam Bayildi is a mezze traditionally eaten at room temperature, but I like it just as much straight out of the oven. I made this Imam Bayildi in the third Istanbul episode of my show, you can watch it here. Wash the aubergines and peel off a few long strips of skin with a vegetable peeler, leaving gaps in between so you get a zebra effect. Sprinkle some salt on the cut side of the aubergines, place into a colander and leave to drain for 20 minutes. Meanwhile, peel and chop the onions and peel the garlic cloves. After 20 minutes, rinse the aubergines under a running tap and pat dry. Heat the olive oil in a frying pan and fry the aubergines from all sides until they start to turn brown, for about 8 minutes. If using large aubergines you may need to use 2 frying pans. Remove the aubergines and put on a plate so they can cool a little. Put the chopped onions into the frying pan with the leftover aubergine oil. Add half a teaspoon of salt and fry for 5 minutes until soft. Crush the garlic cloves and add to the onions, and fry for a further 2 minutes. Make a slit along the length of each aubergine and pull apart the flesh so you get a little pocket. Stuff each pocket with a few tablespoons of the fried onion mix. Reheat the remaining onions in the frying pan and add the chopped tomatoes, 100ml water, ½ teaspoon salt, some pepper, ½ teaspoon sugar and the chopped parsley. Bring to a boil, take off the heat and pour into a ceramic ovenproof dish. 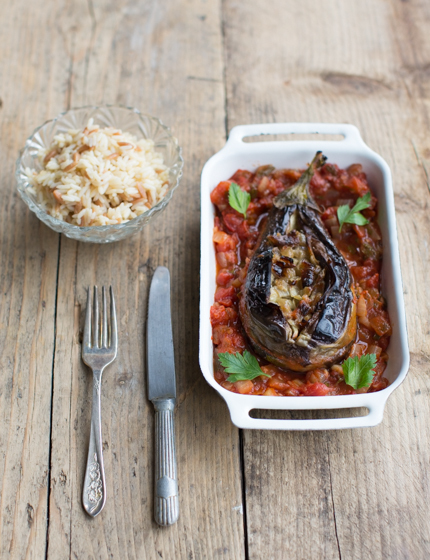 Place the stuffed aubergines on top of the tomato sauce and bake in the preheated oven for one hour. Heat the olive oil and butter in a saucepan. Add the orzo pasta and fry until golden brown. This will take a couple of minutes. Add the rice and stir so it’s evenly coated in butter. Add the stock and bring to a boil. Reduce the heat, cover and simmer until all the liquid has been absorbed. This takes about 15 minutes. Don’t be tempted to lift the lid while cooking and do not stir! Once the liquid has been absorbed, take off the heat. Remove the lid, place a sheet of kitchen paper on the rim of the saucepan to cover and put the lid back on. Leave to rest for 5 minutes before serving. The kitchen paper will absorb the excess moisture and will make the rice nice and fluffy. Serve the aubergines straight from the oven with the warm rice on the side. • If you can only find large aubergines, you can either bake them for longer in the oven, or use this handy trick: after peeling the aubergines to get a zebra pattern, quarter them, leaving the stem and base intact. Sprinkle salt all over the aubergine – inside and outside. 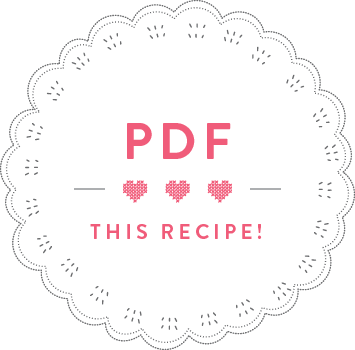 Then proceed with the recipe. You’ll no longer need to cut a pocket into the quartered aubergines¸ simply pull the flesh apart and top with onion mix. It’s best to do this after you have placed them in the ovenproof dish, as the stuffing may fall out otherwise. • You can easily freeze any leftover baked aubergines. Simply defrost on the day and reheat in the oven.